This walk: 2010-11-24. Bellever Forest, Laughter Hole House, Laughter Hole Farm, Loughtor, epiphytic lichen, goat, string-of-sausages lichen - Usnea articulata, Loughtor Gate, Postman's Road, blocking stone, Loughtor Man, Haytor, Laughter Tor, sheep measure, Billl Mudge Memorial, Laughter Tor Cross. Extra photographs taken the following day, 25 Nov. 2010, with blue sky. A tramp's heartbreak - a long undulating forest road. One of the horses was curious as to what we were doing, walking by. An interesting tree - a Scot's Pine, see the bark and leaves (needles) on the extra page of photos from the following day. One measure of air purity is based on the presence/abundance of lichens, where different lichens can tolerate different levels of pollution. The method uses the Hawksworth & Rose Zone scale for the mean estimation of mean winter sulphur dioxide levels in England & Wales (see Table 1). With a scale of ten levels of pollution/purity, the presence of Usnea articulata indicates the purest air - see the bottom line of the linked web page. Strollers breathe only the best air! Passing through the farmyard at Laughter Hole Farm ..... here since 1733. Once the site of an earth tremor, on Christmas Day in 1923, when the Christmas decorations fell down. Looking back through the yard. Loughtor Gate onto the open moor. This is part of "Postman's Road", between Postbridge and Dunnabridge. It was ridden daily by Jack Bellamy, the postman in years gone by: see HERE (from 1957) and HERE (from 1963) for Pathé News clips (you may have to endure a "commercial" first). The first video shows Laughter Hole Farm. Six days a week, he rode 10 miles, visiting 45 farms. Two strange stones beside the track. A blocking stone (left) at the end of a poorly-preserved double stone row and Loughtor Man standing stone (right). Zoomed view to Haytor, 10.5 km (6.53 miles) distant, on a bearing of approx. 78°. As previous photo, from another angle. Eric Hemery in High Dartmoor, pages 488-491, says: "
Another view of the sheep measure, also known as Laughter Tor pound. ..... and the western rocks. The tor is not an impressive rock pile but the view from the top is a full 360° panorama. The area around the tor was heavily settled in the Bronze Age, as described by Jeremy Butler in Dartmoor Atlas of Antiquities, Vol. 2 - The North, Map 27.13-16, pages 46-47. The memorial is in a recess visible in this photograph along the right edge of the stone, near the camera. The stone is located at SX 65268 75673, just south-east of the western rocks of Laughter Tor. Another view, showing clear wooden wedge marks along the top-left edge, showing how the stone was cut. Looking back at the sheep fold. From the other side of the wall, the base of the cross (left) can be seen to be shaped to fit in a socket stone. Also, hidden edges are grooved or chamfered. There are questions as to whether the cross was actually finished or was abandoned, to be incorporated later into the wall. The story of the cross is also shown HERE, on the Legendary Dartmoor web site. The nearby stone row was also believed to have been robbed when the wall was built. Showing the cross in relation to a nearby rock pile and small tree. An unidentified fruticose lichen, so-called because of the branched, shrub-like thallus (body), attached by a sucker-like holdfast. Stalked fruiting bodies (podetia, sing. = podetium) of a Cladonia-type lichen, growing with a moss. Picnic area back near the car park. Back at the car park. 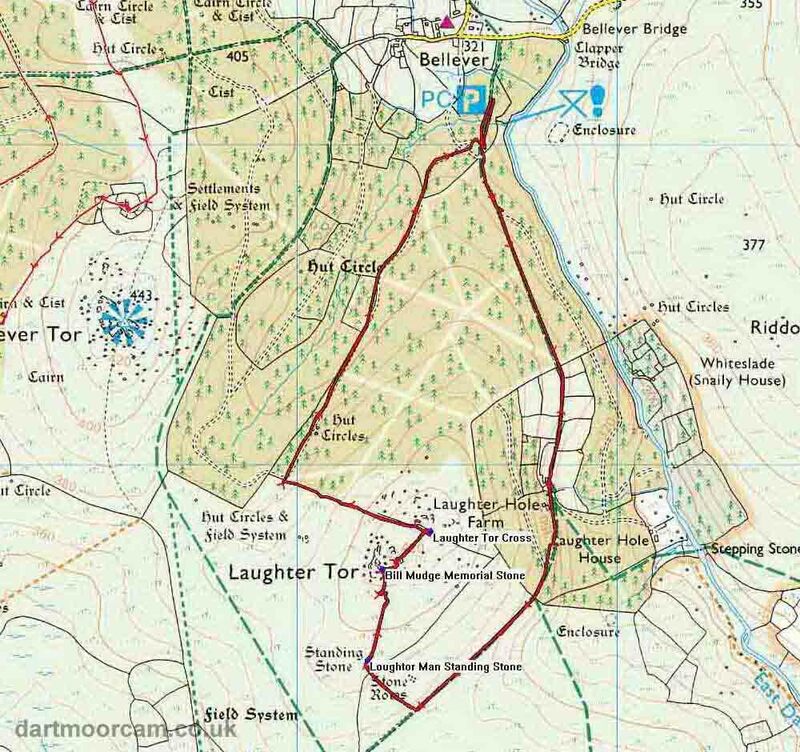 This walk was reached by taking the road south from Postbridge, to Bellever, turning left and then right into the forest to the P symbol on the map (parking fee: £2 for over two hours) .